You guys, I just started a bi-weekly show with the feedfeed called SPLURGE and I’m so excited about it! Each month will be themed (the theme for July is yeast-based treats) and will deal with both sweet and savory baked recipes. This recipe was for my first episode, which I will link to as soon as it is up on the feedfeed’s website. If you have any special requests or recipes you’d like to see me make on the show let me know, I’d love to hear! Beer. Go for a light, mild tasting beer. We want something that will echo the yeasty flavor of the dough, but not be overbearing. You want the beer to feel warm (not hot) to the touch. Put it in a bowl of hot water for about 5-10 minutes to bring the temperature up. Yeast. You can use fast acting or active or instant or quick rising (or whatever your brand is calling it)…I always give the yeast + beer a solid 15 minutes to mingle regardless of the type used. You want it to be foamy and frothy before you move onto the next step. Honey. You can use honey or granulated sugar (equal amount). This helps with flavor as well as developing some nice brown spots while baking. Flour. I have used Italian 00 flour, all-purpose and bread flour…you can use any one in this recipe. Frankly, I recommend all-purpose because it’s always handy and it works great. Kneading. I use my electric stand mixer with the dough hook attachment to aid in kneading the dough. If you don’t have one, knead by hand until the dough is smooth and elastic, adding as little flour as possible to keep it from sticking…I prefer a dough that is slightly wet to a dry one…the outcome of the crust will turn out better. Rise Time. Aim for allowing 1 1/2 to 2 hours for each rise time…but also look for the dough to double in size at each stage…I think that’s often a better gauge. If your home is warm, it will rise faster. You want to set it in a warm, not hot, spot. Also don’t set it near the oven as it can develop dry ‘scabs’ on the dough that can inhibit a proper rise. Sometimes if the weather is especially dry I will put on a pot of water, bring to a boil and turn off the heat to get some extra moisture in the air. Baking. I have used a pizza stone, inverted baking sheets, blah blah blah. I find the best results come from a 500 degree F oven (nicely pre-heated), with the pizza baked on a baking sheet on the top rack in the oven. Burrata. 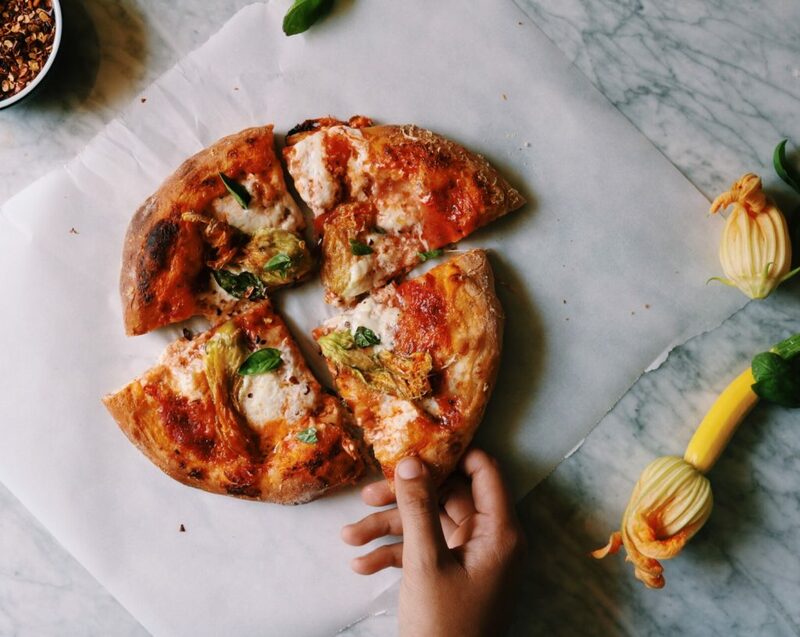 Your instinct will tell you to load the pizza up with the burrata…resist. A little burrata goes a long way…you just want to throw some small globs here and there. Let’s bake some delicious pizza, shall we? Preheat your oven to 500 degrees F and make sure you have a rack in the top third of the oven. Put about three tablespoons of pizza sauce on each pizza, leaving a 1-inch gutter around the edge that is sauce free. 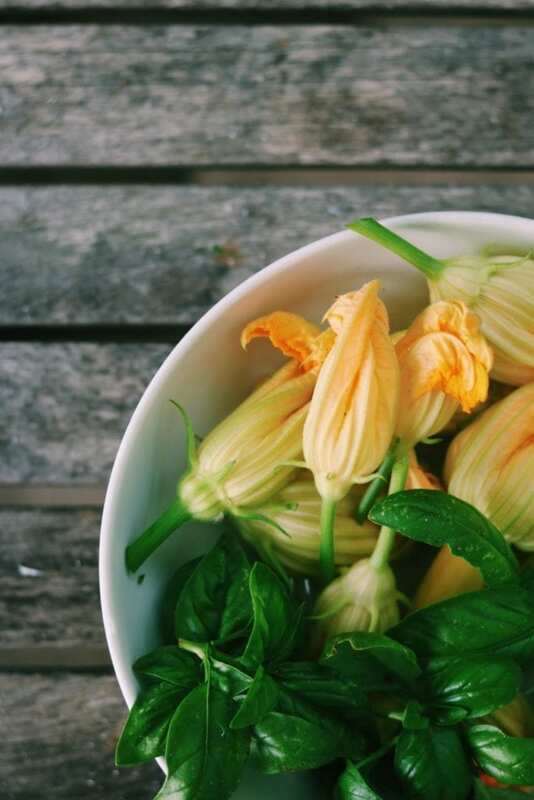 Sprinkle with some burrata (don’t overdo it), add the basil + squash blossoms, add a wee more burrata, sprinkle with some parmesan and drizzle with a bit of olive oil. Bake the pizza on the parchment-covered baking sheet on the top rack of the oven for 13-15 minutes until bronzed in spots. Let sit for at least five minutes before cutting into the pizzas…you want the cheese to firm up a bit. Also, the squash blossoms can weep some moisture onto the pizza…if they do, blot with a paper towel to absorb. Sprinkle with some more basil leaves and eat. Enjoy!!! This is the last week-ish to vote for the Saveur Food Blog Awards…I’d love your vote! My URL is https://www.displacedhousewife.com and I’d love to be nominated in the baking + sweets category. It takes just a second and the more times you vote the better…I would be much obliged!!! I think that’s it!!! I hope you all are having a wonderful summer. Sending lots of love + light! Oh it looks sooo good!! I’ve never used squashblossoms, do I have to do anything to them or just go right ahead and put them on the pizza? Just rinse them right before using and that’s it!!! They will wilt into the pizza while it cooks!! YUM!!!! Oh my goodness! Just saw blossoms at the farm.. with beer crusted dough – sublime! I’ve tried ‘quick’ pizza dough before and I’ll never, ever do it again! SO not worth it. The yeast has to develop it’s flavors.. the gluten, rest. These are SO important to a good homemade pizza. Otherwise, why bother!? Congrats on your new show, Rebecca! How exciting! I will be on the lookout for your first video! Yay YOU! 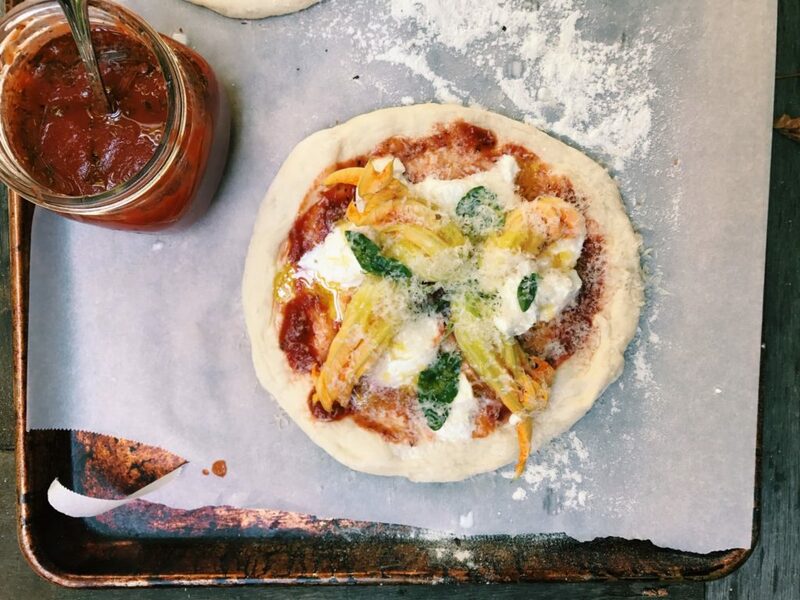 Looks and sounds incredible, and we’re SO jealous we missed out on the pizza-baking session! And congrats on your new show, that’s so exciting! Can’t wait to see the video! This is pizza perfection!! Love that beer crust and squash blossoms get me every time – so pretty! They’re so pretty!!! I’m trying to think what I’m going to do with them next!?? This pizza looks spectacular Rebecca. You are totally just an enabler to my cravings at this point. This pizza was divine! 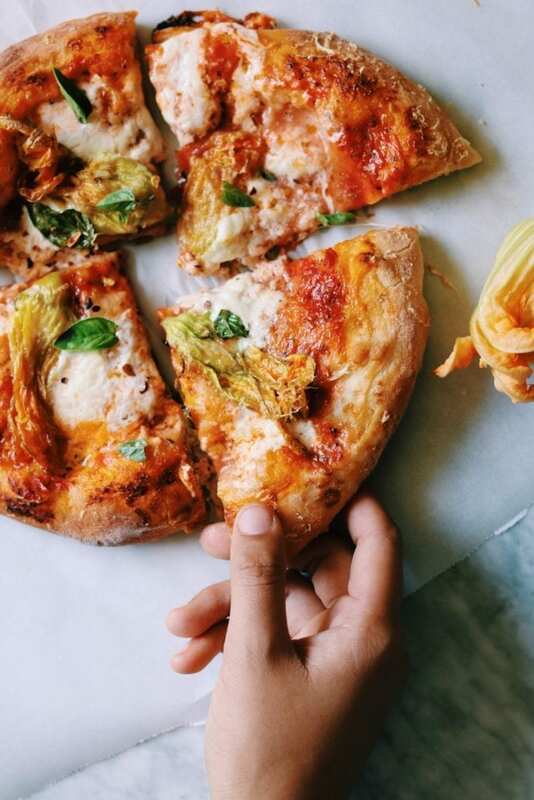 I Can’t believe I’ve never had squash blossom pizza until this weekend! Those squash blossoms are just beautiful Rebecca! How lucky you are to have so many in your garden. I can’t wait to tune into SPLURGE! You’re going to be great and so is this pizza! I’ve got to try it! 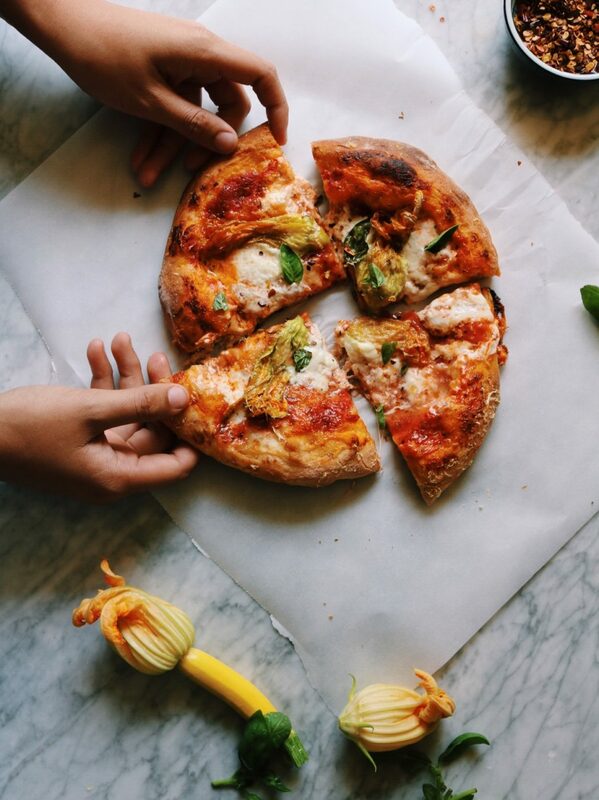 I never would’ve thought to put squash blossoms on a pizza! So creative! I’m going to have to try these soon! It’s so yummy — I hope you try it!! This looks great! I can’t wait to make the recipe.